The State Government of Karnataka is running one welfare scheme named – “Sandhya Suraksha” which is aimed to provide financial assistance and support to the senior citizens of the state. This scheme helps the old aged get the extra care they need. The scheme also provides the beneficiaries with monthly pensions which may be utilized to procure the basic amenities for the senior citizen. The eligible citizens may apply for the scheme through the official website. They take a printout of the same and fill the application form later may visit http://www.karnataka.gov.in/welfareofdisabled/Documents/form_pension_scheme.pdf . The name of the applicant, with specific gender and name of father / husband is to be filled. Provide the name of the District / Village / Taluk where the residing. Write the full postal address in the mentioned column. The age of the applicant is to be provided along with the Date of Birth. The certified copy supporting the DOB shall also be attached with the application form. Any visible identity mark is to be mentioned. The details of all the relatives of the applicant along with their age are to be provided. The annual income of the applicant along with the combined income of the spouse/ family is to be mentioned. Any form of deposits / bank balance which is held by the applicant or his/her spouse is to be clearly mentioned in the application form. Mention the list of documents which is enclosed along with the application form which will include age certificate, occupational certificate, domicile certificate and affidavit of deposits in specified formats. The filled in application form along with the enclosures is to be submitted to the Gram Panchayat or the Block/Municipality office. The scheme will not only provide necessary financial assistance to the eligible beneficiaries, but also extend necessary assistance to the NGOs to set up old age homes so that they may cater the senior citizens. Monthly pension – The beneficiaries under this scheme will receive a fixed monthly pension of Rs. 1000 from the state government. Apart from this, those who use KSRTC for travelling will also get bus passes so that they may get concessional bus transportation. NGOs work with govt. – The NGOs which will assist the Government in implementing this scheme will also issue identity cards to the scheme beneficiaries. For each issue of identity cards, the NGOs will receive a sum of Rs. 25. Medical facilities – Apart from the regular pension, the Government will also lend its supporting hand to provide medical facilities to the beneficiaries through the NGOs. Old age is the time when maximum medical care is needed. Day care centers – The government has set up some day care centres in areas like Gulbarga, Belgaum, Hubli – Dharward, Bangalore, etc. which will take care of the senior citizen and support them. Helpline centers – Under the scheme 14 help lines are also been set up at places like Bangalore, Hubli-Dharwad, Raichur, Mysore, Shimoga, Mangalore, etc. which will also be assisted by the Police Department and the NGOs. The police will respond to every stress call done by the senior citizen under this scheme. The scheme may be joined by senior citizen, both males and females, who are aged at 65 years and above. They must be a permanent resident of Karnataka. The scheme will provide benefits to those senior citizens who were small farmers, weavers, fishermen, agricultural workers, employees of unorganized sectors, etc. This implies that those who are not financially stable and do not posses any fixed pension plan (either private or public) may apply. To join the scheme, the combined annual income of the applicant and the applicant’s spouse should not exceed Rs. 20,000. Apart from that, the bank account of the applicant should not have more than Rs. 10,000 as savings, to be eligible for the scheme. Age proof – Document for supporting Date of Birth which may be School certificate, driving license, voter card, passport, Aadhar card, ration card, etc. Residence proof – A proof of residence is essential to join the scheme which may be the LPG connection bill, electric bill, tax bill, water bill, telephone bill, etc. A residential certificate signed by the concerned authority may be submitted. Bank account details – As the scheme has some restriction based on the income of the applicant, one will have to provide a recent income certificate which should be below Rs. 20,000 per annum. Apart from that, the bank account statement is required. If the applicant is availing any other form of financial assistance which may either be private or a government sponsored, then he/she must provide necessary documents. The occupational certificate is another mandatory document which is to be signed by the Tahsildar of the respective Taluk. During old age, everybody require extra medical attention, proper nutritious diet, social and recreation facilities, etc which will be fulfilled by this scheme. Apart from helping the old aged economic backward citizens, the scheme will also lend its support to the NGOs and other old age centres which are dedicated to serve the senior citizen. 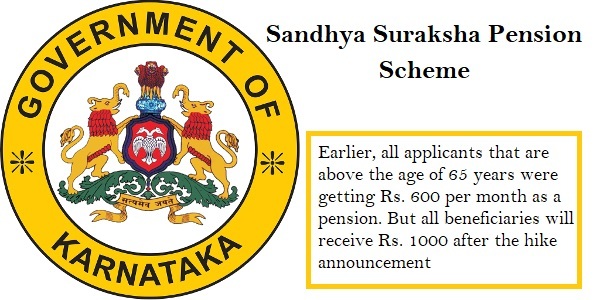 Karnataka chief minister has declared that the state will increase the pension amount under Sandhya Suraksha Pension scheme. Earlier, all applicants that are above the age of 65 years were getting Rs. 600 per month as a pension. But all beneficiaries will receive Rs. 1000 after the hike announcement. The CM also suggested that this hike will put some pressure on the state finance department. But it is ready to make necessary changes to offer more financial assistance to the needy senior citizens.